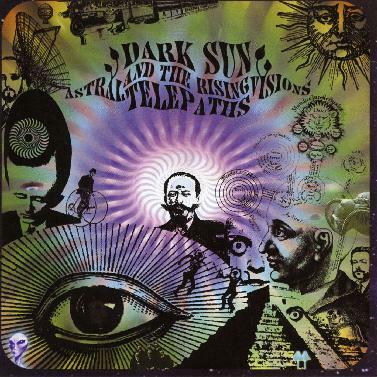 Dark Sun and the Rising Telepaths - "Astral Visions Vol. 1"
Dark Sun is the long running Finnish Psychedelic space rock band from Helsinki. The band has not released anything for quite for a long period of time but that does not mean that most of the members have not been jamming in the meantime. This double CD set limited to 100 copies is the best of their rehearsal room jam sessions from summer 2004-2005. It features fantastic psychedelic artwork by Ylli. Getting Wild starts off slowly but builds into a great intense psychedelic piece with all the guitars flying and creating a heavy psych environment. A great 14 minute jam to start the CD. Space Jam I is next and more relaxed. Dark Sun used to be heavily a synthesizer band, while now the sound is dominated by spacey psychedelic guitar playing, with the synthesizers playing a very minor role in the sound. In Space Jam II, a third stone from the Sun bass line starts things off before the guitars kick into high gear. Dis the Key is really like a track that they develop almost into a song and features some far out sounds that spin in your head. Cosmic Waste is 3 minutes of very spaced out noise. We Get High is a nice short melodic jam. Spaced Out Again continues this vibe and features a beautiful guitar solo to start the piece and then the band fly out into space. The Dream of Judas features a spoken word poem while the band slowly space out. Nice. Pohjoinen Viisaus is sung in Finnish and begins very mystical-magical with cool guitar. The 18 minute Flight to Utopia ends the first CD of killer psychedelic jamming. CD2 is 12 tracks in 75 minutes and is a bit more uneven than the first CD, but also features more experimental stuff with Santtu switching to synths and Mikko from Synths to bass, etc. Solar Jam is a slow building groove as more and more sound build up and perhaps people joining as well. It features a drum solo at the end. Dreaming in Purple is very dreamy. Monster Jam runs 13 minutes and features a lead synth solo. Sam on Mars features drumming as a spacey groove builds until Janne comes in on vocals. You Can Run But… kicks things up into high gear again. This is the first real upbeat jamming track on the second CD but it only flies shortly. The Second Coming features some great guitar playing on this floating space piece. Opening Jam is next and features a cool phased out psych guitar groove. Open Your Mind features Janne on vocals and is quite a melodic piece. Backwards in Time is 1½ minutes of something they turned backwards and it sounds very strange. Sun God/Psych Avengers is the coolest jam on CD2, but be patient. It is slow to start but gets very spaced out. Space and Time is another dreamy piece. Time Machine ends the CD and features some organ way in the background and a strange jam. If you like free form psychedelic rock jamming then you will enjoy this quite a lot and it will be a collectors item for sure! The CD is available from the band through their web site, the Aural Innovations mail order store and CD Services in Scotland.